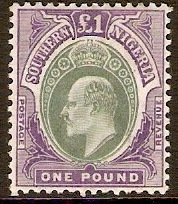 Home :: Nigeria :: Southern Nigeria :: Southern Nigeria 1903 £1 Green and violet. SG20. Mounted mint 1903 £1 Green and violet. SG20. King Edward VII definitive stamp. NOTE: Brownish gum.